It seems like Apple’s food symbols aren’t the only emojis that are leaving an unsavory taste in people’s mouths. This week, Apple rolled out 70 new emoticons, including one resembling a stale-looking bagel, but it’s not the brand’s fresh, shiny icons that apparently need fixing. 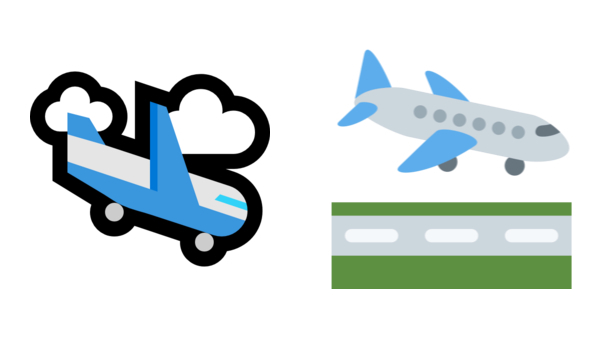 A number of airports are requesting for a tweak in all ‘airplane arriving’ emojis, which first appeared in user interfaces in 2014. For context, mainstream emojis follow the Unicode Standard, which offers some direction in how the icons are supposed to look across the board. This is to avoid miscommunications between, say, an iPhone owner and Android user. The Dallas-Fort Worth (DFW) International Airport has pointed out that the emoji, which has its nose tipped downwards, doesn’t paint air travel in a positive light. “On behalf of #AirportTwitter and pilots everywhere, we’d like to kindly request a re-angling,” it tweeted, attaching its proposed redesign of the graphic. You can thus understand the airports’ concerns over the way the emojis are presented. It’s time to make a departure from the current iterations, emoji designers.